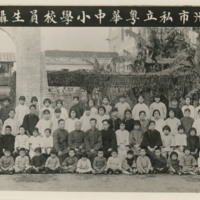 Fung Kei Liu (Class of 1922) pictured with other teachers and students of Yuet Wah Middle and Primary School (with inscription in Cantonese on the front of the photograph). 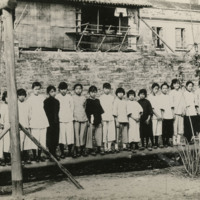 Photograph of fifth graders in Canton (now Guangzhou) all standing next to a wall. The inscription reads "The fifth graders and myself. They began English with me last fall. If you would come now, they would be able to to converse with you some." Fung Kei Liu (Class of 1922)." 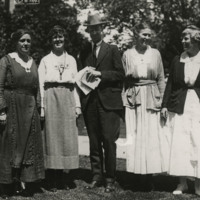 Faculty members standing for a group photograph in front of a pathway. 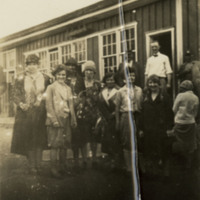 Faculty standing in front of a building. Gift of Helen Herman, March 1986.